Engine bearings both reduce friction between the rotating part of the engine and the stationary part and support the crank. The bearing material must be extremely strong because of the stresses caused by the explosions inside the internal combustion engine. 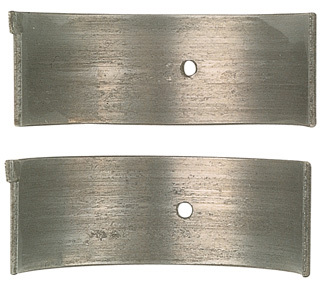 Reducing friction is accomplished in part by the fact that dissimilar metals slide against each other with less friction and wear than similar materials will. 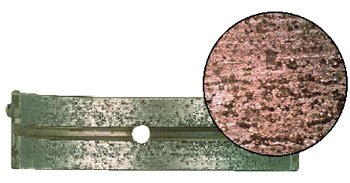 Figure 1: Overplated copper alloy bearing gouged by cast iron debris. Inset photo shows the microscopic detail of the gouges. So an alloy bearing material does a much better job of keeping a steel crankshaft moving than a steel or cast iron bearing does. 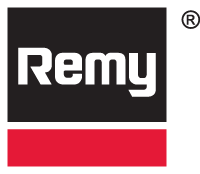 Although the material itself may give the engine bearing some friction-reducing properties, its performance is enhanced by a lubricant between the moving and stationary surfaces. Another of the bearing’s duties is to establish and maintain a film of oil. 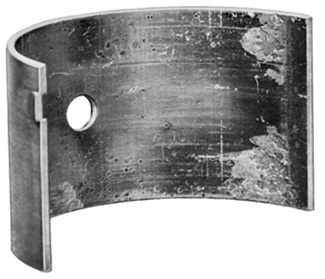 Figure 2: Babbitt bearing embedded with machining debris. The inset photo shows microscopic detail of the debris. The bearings usually do a very good job at keeping the moving parts moving; however, when a bearing fails, the results can be catastrophic. Figure 3: This aluminum bearing was damaged by embedment of glass beads. This photo shows the extent of the damage. Even when they fail, it’s usually not the bearing’s fault. With a bit of investigation, an engine specialist or technician can discover and eliminate one of literally dozens of reasons for premature wear or failure. 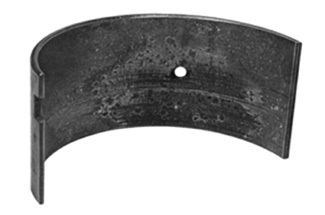 Debris, such as dirt or dust, can cause significant damage to a bearing surface. If it’s in the lubrication system, dirt will usually leave circumferential scratches and will often remain lodged in the bearing’s surface. 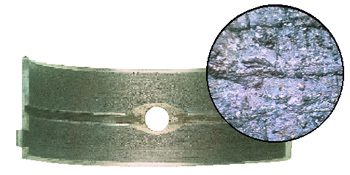 Figure 4: Foreign particles in the bearing lining may be the result of improper cleaning or a failure to replace the filter and may include road dirt and sand. Be sure to always flush the lubrication system thoroughly before reassembling an engine to avoid engine bearing damage. Another way dirt can play havoc is if the engine components aren’t completely clean. A foreign particle trapped between the bearing back and the housing will cause a raised area in the bearing. This little hump can lead to contact between the bearing and the crank journal. You should always ensure the bearings are installed in clean surfaces. A complete lack of lubrication in the crankcase usually leads to seizure of the bearing and total failure of the engine. But, experts say a more frequent issue regarding lubrication is simply inadequate oiling. The absence of a proper oil film will result in metal-to-metal contact, occasionally to just one bearing or often to a number of them. Figure 5: Lubrication is vital. This shows the result of a dry start. The bearings on the left, furthest from the oil pump have the most wear. 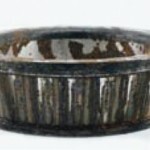 When the bearing is damaged by oil starvation, you’ll find a very shiny surface and evidence of wiping. 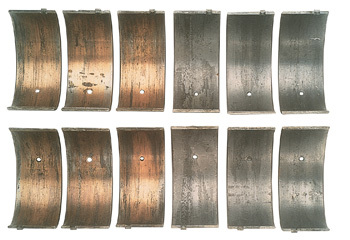 Remember, the failure of the oil film can be seen in a variety of ways on the bearings. 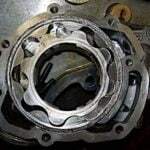 Check on such things as blocked oil passages, a malfunctioning oil pump, improper bearing selection or installation, oil seal failures, fuel dilution (often caused by blowby of fuel and air past the piston rings) or foaming or aeration, caused, ironically, by an overfilled crankshaft. Sometimes, failures are the result of simple installation errors. For example, if a bearing half without an oil hole is improperly put into a position where the hole is needed, that journal will receive no lubrication. Figure 6: Low oil supply or oil starvation doesn’t just sound bad, it does bad things inside the engine. Other types of assembly errors may also be seen. If a connecting rod or main bearing cap is installed in the wrong position, or a bearing isn’t set into place securely, lubrication will be insufficient and cause failure. Careful installation procedures are, of course, critical in every aspect of engine building — careless errors are always expensive. The term “crush” refers to the outward force created by the portion of the bearing that extends above the housing bore when the bearing halves are set into place. This “extra” material holds the outside diameter of the bearings firmly against the housing bore when the assembly is torqued to specification. By increasing the surface contact between the bearing and connecting rod housing bore, crush minimizes bearing movement, helps to compensate for bore distortion and aids in heat transfer. Figure 7: Too rich a mixture or blowby past the piston ring can lead to dilution of the oil. This damage can be seen here. In simple terms, bearing crush is what holds the bearing in place. Think of it as putting 10 pounds of something into a five-pound bag. The tang or locator tab on the shell that fits the saddle is only for locating the bearing during assembly. When crush is correct, slightly elliptical bearing shells conform to a perfect circle when they’re torqued into place. In this way, the crankshaft rotates properly. However, when there is excessive crush, the additional compressive force causes the bearing to bulge inward at the parting lines causing side pinch. Excessive crush may be the result of an attempt to reduce oil consumption by filing down the bearing cap, assembling the bearing caps too tightly by over-torquing the fasteners or, in some cases, using too few shims. Insufficient crush, on the other hand, will result in bearings that are not held securely in the bore, and remain free to move back and forth within the housing. 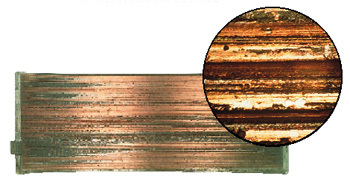 Figure 8: Excessive wear seen near the parting lines of upper and lower shells was caused by bearing cap shift. 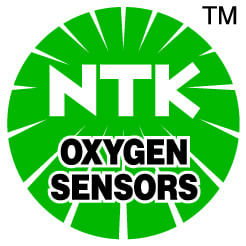 This results in metal-to-metal contact and excessive pressure-causing deterioration. Because contact between the bearing back and housing bore is necessary for cooling, this condition means heat transfer away from the bearing is impeded, resulting in overheating and deterioration of the bearing surface. Figure 9: Fillet ride occurs if the radius of the fillet in the corner of each crank journal is larger than needed. The edges of the bearing can then ride on those fillets rather than fitting neatly between them. – Shiny areas will be seen on the back of the bearing due to its rubbing back and forth. In some cases, discoloration may be seen where oil has worked its way between the two surfaces and burned. – Overloading may be caused by vehicle operator error. 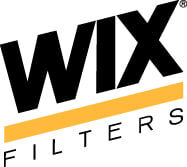 Excessive idling can result in an oil film that can’t support the load needed. 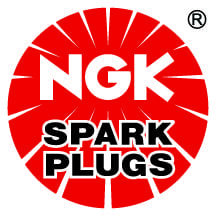 – Engine lugging can distort the crankcase and/or crankshaft, affecting the connecting rod and/or main bearings. – Hot rodding, or forcing excessive loads, can similarly affect the bearings. Engine tuning and operating conditions should always be followed and appropriate bearing materials chosen for the application. A vehicle that leaks oil has its share of issues. But, some vehicle owners who have cars or trucks that do not leak oil are in an even more potentially serious situation. At least the leaker lets you know it needs oil added now and then, with fresh oil maintaining its levels. The engine that seems to be leak-free can be overlooked, yet after a certain amount of time, the oil begins to degrade. The acids in the oil then attack the bearing surface. Proper selection of bearings will go a long way toward a successful engine build. And checking assembled bearing clearances to make sure the bearings are not too tight or too loose should always be done as a final check to make sure oil clearances are within the desired range for the engine. 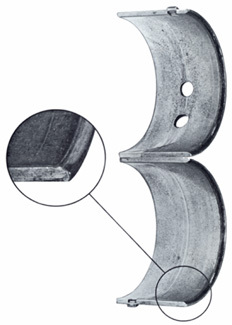 Figure 10: When there is excessive crush, the additional compressive force causes the bearing to bulge inward at the parting lines causing side pinch. Attention to the machining and material selection processes at the front end should help reduce the chance of bearing failure down the road. But should those mysterious bearing failures occur, you should easily be able to find the cause. Good oil pressure is important for proper engine lubrication and longevity. The key to good oil pressure is a quality oil pump. 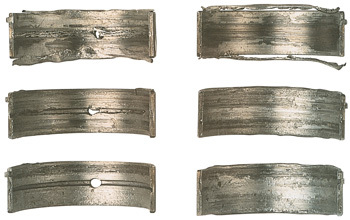 A quick reference for identifying the signs of water and debris contamination in bearings.